Lightning fast pathfinding for Unity3D. Whether you write a TD, RTS, FPS or RPG game, this package is for you. With heavily optimized algorithms and a large feature set but yet simple to use, you will be able to make those bots a bit smarter in no time. 500+ votes and 5 stars! Navmesh cutting is used on Recast graphs (automatically generated navmeshes) to provide fast graph updates with high precision even in very large worlds. Watch a video to see what it's all about! This is a fantastic add-on and I highly recommend it. I had my troops finding paths and navigating within the first hour. I've been playing with the more advanced features since then, such as path smoothing, and it's all very impressive. This package is powerful, flexible, well designed, and intuitive. After playing with various path find tools and sinking money into them this finally worked almost instantly. Dont bother with the others this is the best. Logical easy to integrate. Thank you so much for this package. Easy to use and it actually works!! It has something for everyone. Lots of features and it's fast. Even works for mobile. Support is quick and always helpful. The code is well written and have lots of comments. I use this in all projects where something have to navigate through a changing environment. Like many I started with the free version but quickly switched to the Pro version. Totally awesome, well written code and after messing around with it for a few days I was up and running. After some tweaks (the source is well written and documented) I was able to have it fully multi-threaded on PS4 and running very efficiently. Also the author assisted me when I wanted to make a few small modifications. Went above and beyond. Great asset, stop reading this and buy it. I've been playing with this for a while now on the free version and jumped at the chance to buy the pro version when it was in the sale. So far this asset has saved a lot of time, specially with some of the additional features included in the pro version (randompath/fleepath etc). The support has been excellent, i've asked a few questions to help get my head around it and the publisher has replied instantly with a detailed response. The last reply came back within 3 minutes! Five stars for you sir, well done. Unity's built-in nav system was too limited for the project I was working on. I needed to create nav graphs at runtime and update them on the fly. That is exactly what this package does, and then some. I also have the second best other asset which is Apex Path and Apex Steer which do NOT even come close to the pure brilliance of A* Pathfinding Project. Put it this way. Procedurally generated terrains (RTS style game) Apex Path just falls over. Crash and burn style. But A* Pathfinding handles it out of the box with the Recast Graphs. Yes it takes 30 seconds to generate the graphs. Aha but wait. With A* Pathfinding Project we can make our own modified version of the Graph Generators and optimize it to our scenarios. 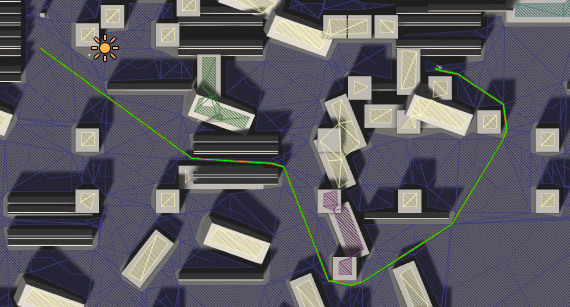 All I can say is that A* Pathfinding Project is way beyond amazing. I'm interfacing with the pathfinding entirely through scripting. I first tried "Apex Path", and after a few hours I couldn't figure out how to update the grid and manipulate it to the level that I require. Apex was very opinionated about how I do everything, so it wasn't a good fit for me. Then I tried Astar Pathfinding and immediately it made sense to me. In a few hours I was up and running, building the grid and recalculating nodes exactly how I wanted. As I delved in deeper I was continually impressed, so I bought the pro version. The multithreading is incredible. The source code *clicks* with me, I find it easy to understand and extend, where as Apex's source code was maybe a bit too verbose and... again, "opinionated". I really apprecate the this project, I was worried I'd be sinking weeks into building my own solution. Thank you! Quick to implement and use, versatile and well structured. The best pathfinding asset i have ever seen. After I spent $10 here and $20 dollars there (probably spending more than this project cost) I finally broke down and shelled out the money for this pathfinding project. Well, if anything proves the adage 'You get what you pay for' this is it. If I had just gotten this earlier for my project it would've saved me a lot of time and money. [...] This is the navigation system I would've expected from Unity themselves. Cannot believe how amazing this is. Docs, examples and everything in between ready to plug-in to your game. Don't have time to write the individual lines of code to use the API then just use the ready-made code that the package provides. Outstanding Value! This is a must have tool. Got AI in my game running in about an hour. The asset is extensively documented with text and video tutorials. There is even support from the creator on their forum. Just an great asset that can be used for so many applications. I am using it for an RTS game. Don't waste time, just buy it. This is a very deep asset, that can take a while to really grasp everything it can do, but once you figure it out, it's pretty amazing, and it's worth the time it takes to learn how to use it, because in the end, it'll save you a TON of time. It's also worth noting that the support is outstanding. I ran into a problem while trying to customize the way this works for my specific project, and Aron went above and beyond to help me find a solution that works for me. I couldn't be happier with what this offers, and I look forward to getting more familiar with all of the functions. This asset is truly inspirational! Now my characters no longer get stuck after running face first into walls! Powerful path finding with clean efficient code. Developer is active and responsive. 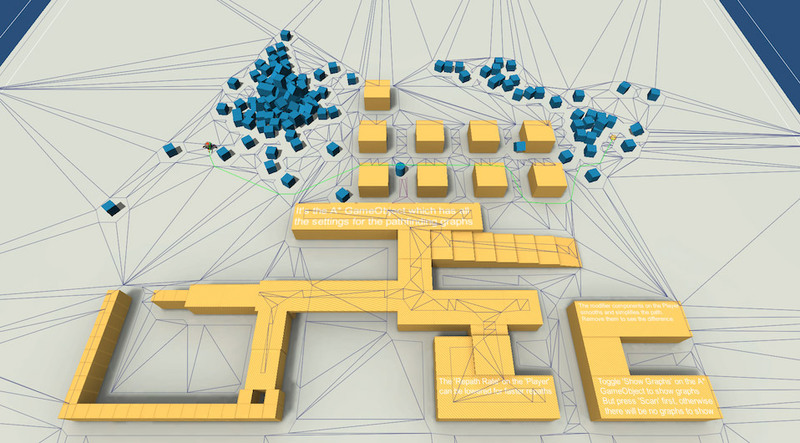 Packed with features and more performant than unity's built in pathfinding. What more could you ask? Along with great support, this is the perfect add-on. Thanks for a great asset. I'm very impressed by this asset! Examples are great, it's well documented, and this pro-version's automatic navmesh generation works right out of the box. In a quick prototype I threw together today I had little soldiers running all over the place, up and down ramps, around trees and other obstacles. My favorite pathfinding solution for years now! Aron Granberg's A* is a community staple at this point, and it's easy to see why. This is a massive upgrade compared to Unity's built-in pathfinder. It's a lot more configurable, the agents are _much_ better behaved, and there's source access. What's there not to like? There's a rich example set to get started, too! The asset has it's own forums over at http://forum.arongranberg.com, and the author is active, so getting help with issues seems to be easy. The only real complain is the comment style. It's not proper C# xml-comments, so Visual Studio and other editors won't include comments with autocomplete menus. The API is generally well commented too, so this is a shame. This pathfinding solution is worth every penny, it is miles ahead from any other solution. Don't waste your time with the convoluted and overly engineered Apex Path or the unity navmesh, this is THE solution for pathfinding in Unity. Far better than Unity's pathfinding system. Some learning curve to master it all, but worth it!!! Pathfinding has always been a bit tricky to get right. But you can stop those thougts right now. This package has got you set up in no time. It can look daunting in the beginning, but it's really simple. So if you are serious about your game, and want a solid solution, then look no further. Besides, the cost of developing such a capable solution will be substantially higher than just getting this package. I played with the free version all day, and now I've purchased the full version. Well worth the minimal cost for all the work that went into this. The kit has everything I need, and more. It is well documented and the coding is easy to grasp. It's incredibly fast (runtime) to-boot. It has plenty of examples and tutorials on the web page. Nice job, Aron, really quite impressive! I cant say that is a bad thing, but this really is overkill for what I wanted from a pathfinding system! This will be the only package I will likely ever need for this. Still learning it tho. If you are looking for a fast and robust pathfinding solution, then this is the one to get. Comes with a lot of examples and tweaking possibilities (i really like that part). Excellent Toolkit, and probably the best support on the Asset Store. So the toolkit itself does everything you'd expect from a good A* pathfinding system. It's particularly efficient too - I had a couple of thousand individual seekers running across a 1000 node navmesh, and it held up pretty well. All of the included classes are well-built, and very easy to customise through either editing the scripts themselves, or by simply messing with the public variables on their respective inspector windows. Lastly, the Developer is extremely engaged with supporting his community - I made two separate forum posts at opposite ends of one day, looking for some guidance with the project I was building using the A* tool. The Developer responded to both posts within a couple of minutes, and instantly solved any problems I was facing. Would strongly recommend to anyone looking for a complete pathfinding solution. Long overdue review for this asset. Where do I even start? This asset does a lot of the heavy lifting for you, in terms of pathfinding. You will most likely go and try to implement one yourself first. As you should. Once you realize how complicated approaches like flood filling are, you will appreciate what this asset brings to the table. It not only provides you with pathfinding, but flexible versions of it. You can have your characters walk across multiple floors, only on certain type of surfaces, etc. The author's customer support is exemplary. If there is anything at all wrong with the asset, he is always there to help. If there is something that doesn't seem to work for you, it will most likely have already been answered in the forums. He is very patient and I thank him for his efforts. As for the price, yes, it is high. However, it is something you will be using over and over, in multiple features and games. I would rather focus on building the parts of the game that are fun, rather than pathfinding, which is why I left that work to this asset. I bought this asset a while back, but as a playmaker user I didn't went through it yet. The documentation is really detailled, every thing a coder needs is in it. However, as non coder, I had some troubles making it work with my setup of FSM. I went on the forum and the creator answered my questions in less than an hour! He's been really helpfull, patient, and quick. A real model for asset creators! Now thanks to his help I can start to fully exploit this incredible asset without much difficulty; A must buy for anyone who needs some proper AIs! The best pathfinding solution on Unity! Not only does the software deliver, but it is well designed, has an intuitive UI and the website has comprehensive How To's, Tutorials and documentation. Well done! This is hands down the best asset in this store. It is extremely easy to use, and has lots of hooks for tailoring it to your specific needs. Awesome asset! Saved me a lot of time. Thanks! The only one serious pathfinding solution for Unity 5. The author is super helpful on the forum. He helped me out with my non-trivial performance-intensive use-case of the package. The package itself has a tonne of options. It is sometimes difficult to wrap one's head around all of them. However the documentation is pretty thorough. And if that doesn't help you can get some help from the author. He literally replied within minutes of me writing. The full version is pretty expensive. You will need it if you are writing a performance focused application where there are many objects moving at the same time and interacting - say 50+ objects moving at once. The source code is easy enough to understand to dig through as well if documentation isn't clear on something. I was using the built in unity pathfinding and it does not offer the flexibility or efficiency that this product offers. So far it is exactly what I needed for my project. Thanks for the good work! I bought it and never regretted the purchase once. It's fast, flexible and easy to use. Recommended! Without this product, I wouldn't have a project. Or rather, I would, but it would have ground to a halt as I spent hundreds of hours trying to make something even remotely as effective as the Pathfinding Project. I would much rather spend tens of hours learning documentation (which this product is replete with), than hundreds of hours trying to reinvent the wheel. In every game where I needed pathfinding, this has been my number one option, and it has proven to be a very good choice. You might have some issues with 2d content, however, you can easily solve those and Aron is working on the proper 2d version as well. The support is great as well. Couldn't recommend this more. Folk Tale will be a sandbox fantasy city builder strategy game in which you lead a ragtag band of peasants in growing a small settlement into a thriving market town, while the dastardly Slavemaster Urzal and his minions plot your downfall. Sound the rallying call and head out into the wilds with parties of heroes and fight back the tide of evil in a game of endless possibilities. 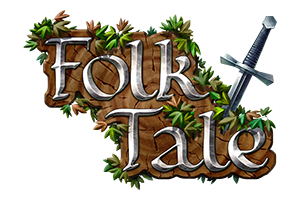 Folk Tale for PC, Mac and Linux is developed by indie collaboration studio Games Foundry. 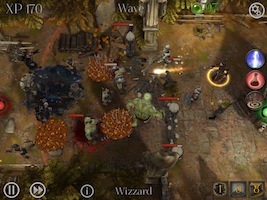 You must defend the Tavern controlling multiples heroes against hordes of enemies. The A* Pathfinding Project power us to run in a mobile 10 to 20 units in realtime using a 4k nodes grid without any problem, even when doing constant weight updates and using nice modifiers like the Alternative Path modifier. 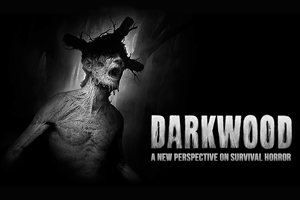 Darkwood - a new perspective on survival horror. Scavenge and explore a rich, ever-changing free-roam world by day, then hunker down in your hideout and pray for the morning light. The A* Pathfinding Project has been a great tool to use in our project, thanks to how easy it is to get it up and running (I had very little programming knowledge when I started work on Darkwood), the multitude of options and complexity under the hood. A ton of features were available out of the box and fit Darkwood perfectly, with very good settings to optimize the pathfinding for our needs to get that extra inch of performance or shave off a few bytes of memory. We easily extended it to cover the needs for the logic for our lighting system, so that the AI can account for areas that are lit. The support we received during development was also very fast and precise.